Creative Collaboration at Gallery 831! Opening reception Friday, January 9, 6-9pm. It is an exhibition featuring individual and collaborative work by ceramic artists Kevin Russell and Richard Paldino celebrating clay and the creative process. For more information check out http://www.clayspace831.com/index.php! New Classes at CLAYSPACE! Ceramics! New Classes start January 5th! Registration for the 8 week class is only $280 per person! It includes 25 lbs of clay, glazes, firing, open studio time during the session and a student gallery show and raku firing at the end of the session. Evening classes meet from 6:30- 9:00 pm once a week for 8 weeks. Classes are small, ensuring students a high level of individual attention. 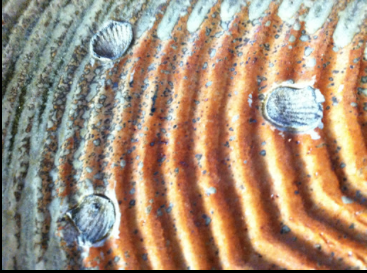 There is also a 4 week Raku Class for $150 per person, which is Mondays from 6:30-9:00pm, January 5-26. Play with Fire! Spend 3 weeks making work to raku and spend the last class firing the raku kiln. Work can be made on or off the potter’s wheel and textured for the kiln. 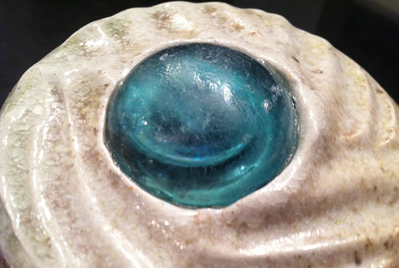 The 3rd class will focus on glazing and the final class will focus on the firing process. 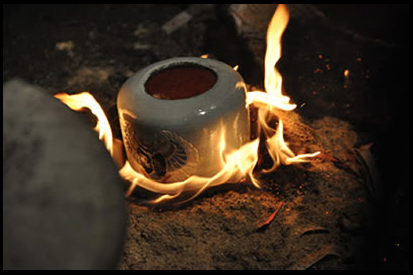 Raku is an exciting and rewarding way to fire your work. The fire and smoke from the reduction chambers add drama to the process and create stunning surfaces on the work. Clayspace is offering a four week Raku class on Mondays from 6:30 to 9 pm from Oct. 20 through Nov. 10! 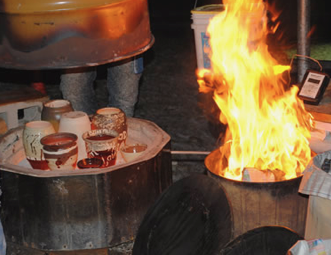 Whether you’re looking for a new hobby or would like to expand your horizons in the artistic world, join OAL member and Clayspace instructor/ resident artist Todd Hickerson through the 4-week journey to the raku kiln! Raku is an exciting and rewarding way to fire your work, and the fire and smoke from the reduction chambers add drama to the process and create stunning surfaces on the work! It’s a skill that will last you a lifetime, and who knows, it could be your calling. At only $150 a person, why miss the opportunity to find out? Spend 3 weeks making work to raku, and spend the last class firing the raku kiln. Work can be made on or off the potter’s wheel and textured for the kiln. 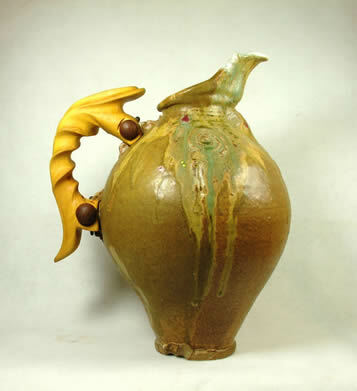 The 3rd class will focus on glazing and the final class will focus on the firing process. If the idea of raku firing is a bit too intimidating, that’s okay! Clayspace is also offering Daytime Potter’s Wheel on Wednesdays from 11:30- 2 pm! This eight-week course (Oct. 20- Dec. 12) covers basic wheel throwing techniques and those for the more advanced. Students work at their own pace with one-on-one support. This workshop is $280/ person, and trust me, you’ll never be more zen. Want to get your wheel on? New eight-week classes at Clayspace in Columbus begin August 25! Try your hand at Potter’s Wheel courses that are available in either Introductory or Intermediate levels, or dabble in something new with the Slab Class! With most classes lead by OAL member and Clayspace artist Todd Hickerson, attendees are sure to gain new insight and skills in any of the hands-on, stress-relieving and exciting courses. For a complete course list and class schedule, check out Clayspace here! Clay From The Classroom Art Exhibit and holiday Raku Party!! Everyone is welcome! Guests may purchase and glaze a handmade piece of pottery for $40 and enjoy the gallery show while their work is fired in our raku kiln by Clayspace artist Todd Hickerson. The kiln is heated to 1900 degrees then opened to expose the red hot pottery inside. The work is removed with tongs and placed in metal cans filled with combustible material which is ignited by the hot pottery. 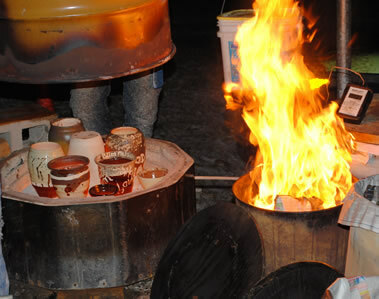 The cans are covered and the fire reacts with the glaze to create iridescent and metallic effects on the pottery. Finally the pieces are submerged in water to cool. 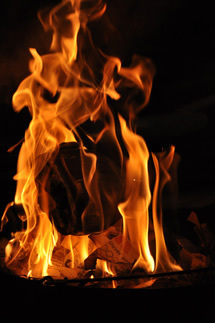 Wiping off the ashes from the fire reveals flashes of brilliance and metallic shine. While you wait for your masterpiece to come out of the kiln you can relax and enjoy the gallery show Clay from the Classroom featuring work by Clayspace artists or sign up for open wheel and take a lesson on the potter’s wheel.